Following his guilty plea to a misdemeanor charge of mishandling classified information, disgraced former CIA director David Petraeus is likely to avoid jail time for a crime similar to those committed by whistleblowers that received far worse punishment. On Tuesday, Petraeus, the famed four-star general who is credited with “saving” American war strategy in Iraq, pleaded guilty to unauthorized removal and retention of classified material. In 2011, Petraeus allegedly allowed his biographer and mistress, Paula Broadwell, to briefly possess eight “Black Books” containing highly-classified material pertaining to his time as top military commander in Afghanistan. The binders contained “classified information regarding the identities of covert officers, war strategy, intelligence capabilities and mechanisms, diplomatic discussions, quotes and deliberative discussions from high-level National Security Council meetings, and defendant DAVID HOWELL PETRAEUS’s discussions with the President of the United States of America,” according to the plea deal. Yet, as part of the deal, Petraeus was not asked to plead guilty for lying to Federal Bureau of Investigation agents who asked if he had supplied classified material to Broadwell, according to court documents. On October 23, 2012, days before Petraeus lied to the FBI about the sharing of classified information, the then-CIA director applauded the guilty plea of CIA whistleblower John Kiriakou, who had revealed to a journalist a covert officer’s identity that, ultimately, made him the only government employee to publicly disclose the CIA’s post-9/11 torture program. “Oaths do matter, and there are indeed consequences for those who believe they are above the laws that protect our fellow officers and enable American intelligence agencies to operate with the requisite degree of secrecy,” Petraeus said in a CIA memo. Kiriakou was indicted in 2012 on one count of violating the Intelligence Identities Protection Act, three counts of violating the Espionage Act, and one count of making false statements. He was sentenced to 30 months in prison, and was finally released last month. In 2010, Army whistleblower Priv. Bradley Manning leaked classified information – including Iraq and Afghan war logs, as well as diplomatic cables, that exposed American war and foreign policy machinations – to Wikileaks. The war logs revealed internal US military information, not unlike the binders Petraeus gave to Broadwell. Manning was charged with 22 counts, including violations of the Espionage Act and aiding the enemy, the most serious charge of which she was later acquitted. After enduring torturous treatment while awaiting trial, Manning was sentenced to 35 years in prison on Aug. 21, 2013 -- she announced the next day that, as a trans woman, she would like to be known as Chelsea. She is currently serving her sentence at the maximum-security, military correctional facility at Fort Leavenworth. Despite a lack of evidence implicating him in the crime, former CIA officer Sterling was recently convicted of all charges against him under the Espionage Act, including nine counts of unauthorized disclosure of national defense information and other related charges. He now awaits sentencing. Kim, a former contract analyst for the US Department of State, pleaded guilty a year ago to one felony count of unauthorized disclosure of secret government information for leaking government secrets to Fox News reporter James Rosen in 2009 regarding a possible nuclear test being planned by North Korea in retaliation to sanctions from the West. The next year a grand jury conducted an investigation that ended with them agreeing Kim “knowingly and willfully” shared information “about the military capabilities and preparedness of a particular foreign nation.” As a result he was indicted and charged with making false statements as well as violating the Espionage Act. He was given a 13-month term in prison. A former contract translator for the FBI, Leibowitz pleaded guilty in December 2009 of knowingly disclosing classified FBI information to Richard Silverstein, author of the Tikun Olam blog, who writes about Israeli-American relations. Leibowitz was sentenced on May 24, 2010, to 20 months in prison. If you're Tom Drake, John Kiriakou or Shama Leibowitz & give secrets 2 journos ull go to prison. If ur David Petraeus, u go scot free. Former National Security Agency official Drake was charged in 2010 with Espionage Act infractions regarding “willful retention” of “national defense” documents. Drake had revealed information to a Baltimore Sun reporter data about waste, fraud, and abuse at the NSA. The information was neither classified nor sensitive. In 2011, the 10 original charges were dropped after Drake pleaded to one misdemeanor count for exceeding authorized use of a computer. Snowden, a former intelligence contractor who exposed in 2013 the National Security Agency’s vast global surveillance regime, has been charged with two violations of the Espionage Act: “Unauthorized communication of national defense information” and “willful communication of classified communications intelligence information to an unauthorized person.” He remains in political exile in Russia. Snowden’s lawyer said this week that the whistleblower would like to return to the US, but only “on the condition that he be given guarantees to receive a fair and impartial trial.” Russia has claimed that the US Department of Justice has assured that Snowden would not face torture or the death penalty if he returned. Hitselberger, an Arabic translator for the US Navy, was accused by the US of copying documents that revealed troop activities and gaps in the US intelligence in Bahrain. He worked in a unit conducting “unconventional” warfare, counterterrorism, and special reconnaissance. Despite lack of evidence of espionage, Hitselberger originally faced Espionage Act charges. In late 2012, a federal judge released Hitselberger from jail and ordered him to remain within 25 miles of the Washington, DC area after he pleaded not guilty to charges of possessing classified documents without authorization. The Espionage Act of 1917 was created to charge Americans who helped the country's enemies. Prior to President Barack Obama’s time in office, it had only been used three times, to prosecute government officials who had leaked classified material. 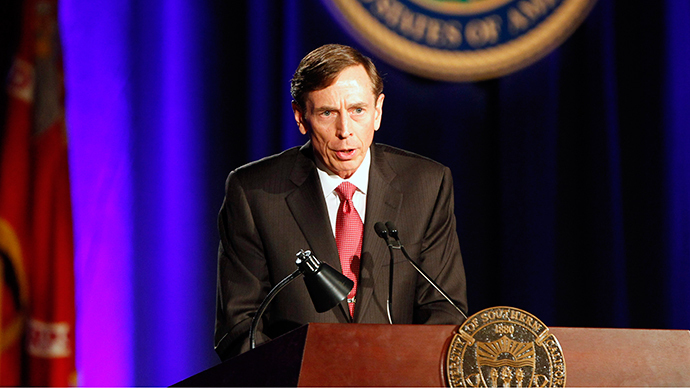 After less than a year on the job, Petraeus retired as CIA director in November 2012 as his affair with Broadwell was revealed.